Slough Jets lined up on home ice for the only game of the weekend against the in form Basingstoke Bison. With starting netminder Kamil Jarina missing through injury and Danny Milton starting in net Slough were off to a great start after 12.11 when Darius Pliskauskas opened the scoring from Dan Davies in the only goal of the opening period. The middle period started with a strong comeback from the visitors, opened just 3.13 in when Nicky Chinn scored a rebound goal and at 25.24 the same player had the first assist on the go ahead goal scored by Joe Rand making it 1-2. Ales Padelek scored a powerplay goal at 34.12 to tie up the game and the same player got the game winning goal at 38.19 to end the middle period 3-2. The final period saw Basingstoke looking to find an equaliser but their hopes faded when at 50.33 when Padelek completed his hat-trick finishing from Pliskauskas and Davies. Milton in goal dealt well with all 10 shots he faced and the 500th EPL game for Matt Towalski ended with a win. 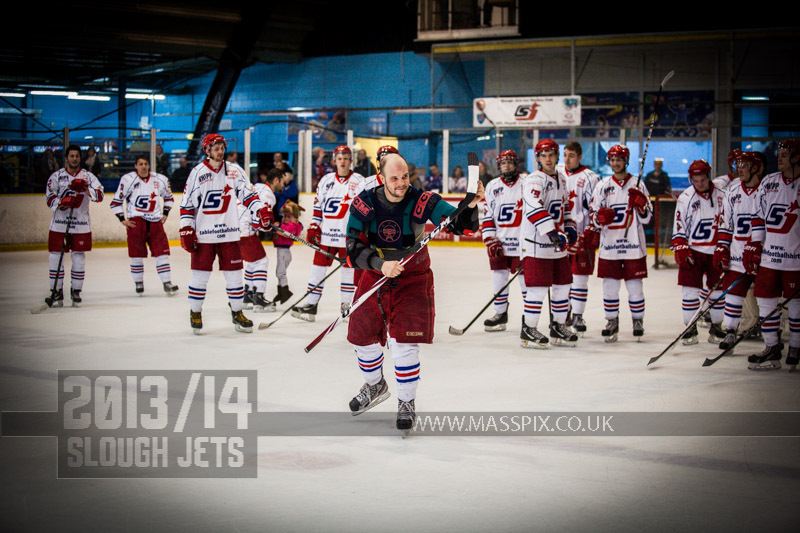 Slough Jets started their weekend on home ice welcoming Doug Sheppard and the Basingstoke Bison to the Hangar with two points in the league up for grabs. Both teams were missing players on GB Under 20s duty with Slough also missing Terry Miles injured. Carl Graham opened the scoring after 9.04 with the completion of Cesky and Sheppard’s work and with 1.50 left in the opening stanza Joe Greener netted against his former team for 0-2. Back out in the second period the game upped in intensity but it was the visitors who netted first to make it 1-3 at 21.55 with Cesky completing from Rand and Symonds. Frantisek Bakrlik scored at 23.10 to pull a goal back for the home team but a powerplay strike from Greg Owen at 25.08 while Mindy Kieras sat out a roughing minor brought the gap back to 3 goals in favour of Basingstoke. Bakrlik netted again to reduce the deficit to just a pair of goals at 31.57 finishing for the second time from Tomas Valecko who this time finished from Dan Davies. Both teams swapped powerplay chances but the second period ended 2-4. Special teams won the final period as Basingstoke converted both powerplay opportunities they were given and killed the one they conceded. Greg Chambers made it 2-5 at 42.36 after 1.11 of powerplay and Owen scored his second at 48.35 after just 7 seconds of the man advantage to make it 2-6. Basingstoke killed a penalty while their coach sat out a holding minor and went on to win the game 2-6. Jurijs Solovjovs took charge of the game and after a delayed face-off the teams played out a scoreless first period, neither team capitalising on early powerplay opportunities. 1.44 into the second period Milton Keynes took the lead with a goal from player/coach Nick Poole. The teams again exchanged powerplays and as the period continued the game took on a more physical edge. Joe Greener left the game at 37.34 with a game penalty for leaving the bench and the period ended 0-1. Slough played great hockey in the third period sparked on by Adam Calder getting the equalising goal at 42.37. Man of the match Ryan Watt put Slough ahead at 44.44 and while more penalties were called the visitors were left chasing the game. Poole called a time-out with 1.10 remaining and pulled the netminder to capitalise on another powerplay but when the penalty ended Mindy Kieras found the puck and buried it into the empty net to complete a 3-0 period. Slough Jets welcomed Milton Keynes Lightning to the Hangar with a win under their belt at MK from earlier in the season. Both teams came out the blocks hard and Slough killed the game’s first penalty at 8.01 before Darius Pliskauskas beat Alex Mettam to make it 1-0 at 15.07. Slough killed a second penalty and held their lead upto the interval. Doug Sheppard pounced at 22.28 to score a delayed penalty goal and give the home team a two goal lead but Slough’s third penalty led to the visitors clawing back a goal when Nick Poole scored at 25.41. MK took the second period when Adam Brittle scored at 34.31 and the second period ended locked at 2-2. Another hard period was played out over the final 20 minutes but special teams won through and Doug Sheppard’s second goal of the night, this one on the powerplay at 46.47 proved to be the game winning goal. The visitors played the final minute with an empty net but Slough defended well and took the win. 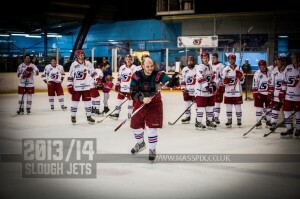 With just one in the weekend Slough Jets stayed home to entertain Romford Raiders for the second time in the season. Romford snuck in first with their only goal of the game when Dallas Constanzo netted at 2.26 but just 7 seconds later Peter Poljacek scored his first to level the game. Despite chances at both ends the period finished 1-1. Slough stepped up in the second period and took the game starting with Joe Greener giving them the lead at 22.03. Poljacek scored his second at 24.12 and Blaz Emersic fired home at 25.33 prompting Jesse Hammill to take the visitors’ timeout. Joe Greener’s second goal at 34.36 was closely followed by Emersic netting his second and this chased Euan King from the visitors net. Slough swapped netminders for the third period and gave Charles Kaylor some ice time and the back-up goaltender obliged with a clean sheet for his 20 minutes. Peter Pojacek scored his hat-trick goal converting a powerplay at 48.05 and earned his Man of the Match award with his fourth goal, a second powerplay strike at 53.22 to finish the scoring.